August 30, 2013 | Justice for Iran (JFI) has learned that the Islamic Republic of Iran’s security and Intelligence forces blocked relatives of victims of the 1988 massacre of political prisoners in Iran from gathering at Khavaran cemetery this morning. This year, like past years, IRI security forces began contacting and summoning families of the victims from late July. According to confirmed sources, these families were issued threats of arrest in the event they attempt to publicly mourn at Khavaran cemetery or gather in their homes; despite the fact that assembly and peaceful gathering is their right. According to close sources, relatives attempted to gather one week earlier, but were met with threats of arrest by IRI security forces. It is estimated that in the summer of 1988, between 4,500 and 5,000 political prisoners were killed in prisons across Iran. The families of those executed were not notified of the killings or provided with a confirmation on the burial site of their loved ones (since they were buried in secret). In 1989, relatives chose September 1 as the anniversary to commemorate their loved ones who were killed. From that year on relatives have been gathering annually at Khavaran cemetery on the last Friday before September 1. This year marks their 25th anniversary. According to the reports JFI has received, when the families headed to Khavaran cemetery this morning, security forces were already gathered outside the cemetery in order to prevent the families from entering. 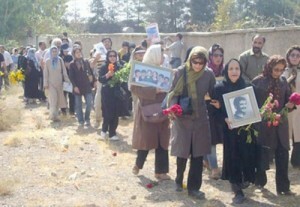 Members of Mothers of Khavaran, a grassroots group with its base in Iran, and JFI believe the aim of IRI security forces is to block any gathering at Khavaran cemetery or at the homes of relatives of the victims. Mothers of Khavaran is largely made up of women whose children, mostly political and ideological activists, were tortured and secretly executed in the masses during the 1980’s by Islamic Republic officials. The group leads a non-violent movement in Iran by annually assembling around Khavaran Cemetary, where some of those executed were buried. The group arranges flowers on the gravesites to pay respect to the lost lives. Despite the peaceful nature of their work, members of the group have faced threats, beatings and imprisonment. In June of this year JFI along with 14 other organizations nominated Mothers of Khavaran for the 2013 United Nations Prize in the Field of Human Rights. JFI asks the UN Special Rapporteurs to urge authorities of the Islamic Republic of Iran to investigate the massacres of 1988 and hold the perpetrators accountable. JFI asks the Special Rapporteurs to urge the Islamic Republic of Iran to respect the rights of victims to mourn, know the cause of death for their loved ones, and the exact location of their burial site. JFI would like to inform the Special Rapporteurs that the massacres of 1988 in Iran are not just a past crime in the country’s history, but rather a present violation of the relatives’ right to know, right to mourn and freedom of assembly. Furthermore, JFI is deeply concerned that Mostafa Pourmohammadi, who was a member of the death commission in the 1980’s, was appointed IRI’s Minister of Justice following the inauguration of Hassan Rouhani. The death commission was a three-member commission set up in Tehran in the 1980s on the commands of the former Supreme Leader, Ayatollah Khomeini. The commission’s role was to interrogate prisoners who had already been issued a sentence for their political and religious beliefs. In 1987 Mr. Pourmohammadi was appointed Deputy Minister of Intelligence during the term of Akbar Hashemi Rafsanjai’s Presidency. According to reports, Pourmohammadi was directly involved in the mass executions of 1988 and the extrajudicial assassinations of political opponents living in exile. Pourmohammadi’s most recent appointment is a clear indicator of the extent that perpetrators in Iran enjoy impunity while relatives of victims are deprived to exercise their basic rights. 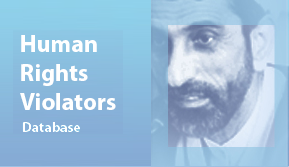 JFI asks the UN Special Rapporteurs to urge authorities of the Islamic Republic of Iran to investigate the massacres of 1988 and hold the perpetrators accountable. JFI also asks the Special Rapporteurs urge the Islamic Republic of Iran to respect the rights of victims to mourn, and be informed of the cause of death of their loved ones and the exact location of their gravesite. JFI would like to inform the Special Rapporteurs that the massacres of 1988 are not just a past crime in Iran’s history, but rather a present violation of the relatives’ right to mourn and assemble freely.